Since my last report I have made the move to live bait with excellent results. Although topwater and slabs are still working, we have been flat wearing them out on live bait. 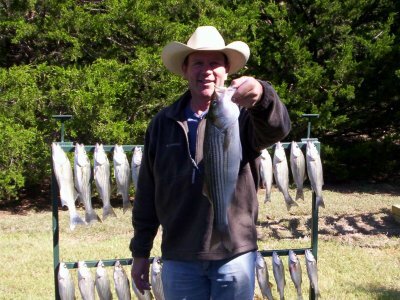 The quality and size of the Lake Texoma stripers caught on live bait is now much better than those caught on lures. Topwater fishing is resulting in a lot of hookups but just a little smaller fish. It has been pretty easy to find bait and a lot of it. I have been sorting thru the bait and keeping the 3-4" threadfin or gizzard shad. This size of bait has resulted on better sized stripers. The smaller bait is also working with lots of hookups, but the fish caught on them have been smaller. For the most part I have been fishing the flats with adventures a couple of days off into the deep 60-75 feet of water, drift fishing. The afternoon trips I fished resulted in excellent results. With the cooler days and evenings the water temperature is dropping which means the Lake Texoma striper fishing is heating up. Be prepared for unexpected weather. Make sure you dress in layers for the cooler mornings and be sure to carry rain gear to keep you dry. 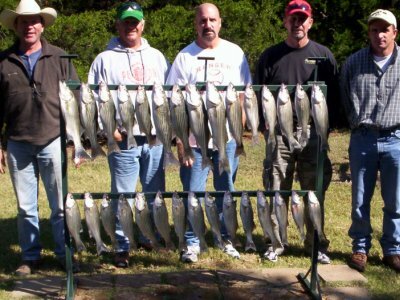 Now is the time to come out on Lake Texoma for some great fall striper fishing.